The special issue collects together publications arising from the NERC-funded (grant no. NE/K002449/1) Greenhouse gAs Uk and Global Emissions (GAUGE) project. GAUGE was designed to quantify nationwide greenhouse gas emissions of the UK (CO2, CH4, and N2O), bringing together a range of measurements and atmospheric transport models. GAUGE will inform the blueprint for countries that are building a measurement infrastructure in preparation for global stocktakes that are a key part of the Paris Agreement. We present a novel approach to estimate the annual budgets of carbon dioxide (881.0 ± 128.5 Tg) and methane (2.55 ± 0.48 Tg) of the British Isles from shipborne measurements taken over a 3-year period (2015–2017). 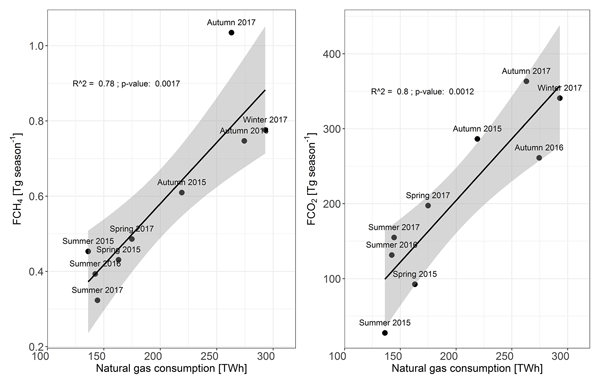 This study brings independent verification of the emission budgets estimated using alternative products and investigates the seasonality of these emissions, which is usually not possible. Methane is an important greenhouse gas & reducing its emissions is a vital part of climate change mitigation to limit global temperature increase to 1.5 °C or 2.0 °C. This paper explains a way to estimate emitted methane over a sub-national area by combining measurements & computer dispersion modelling in a so-called inversion technique. Compared with the current national inventory, our results show lower emissions for Cambridgeshire, possibly due to waste sector emission differences. The Arctic is experiencing warming trends higher than the global mean. Arctic ecosystems are a large store of carbon. As the soil organic carbon thaws and decomposes, some fraction of this store will eventually be released to the atmosphere as methane. 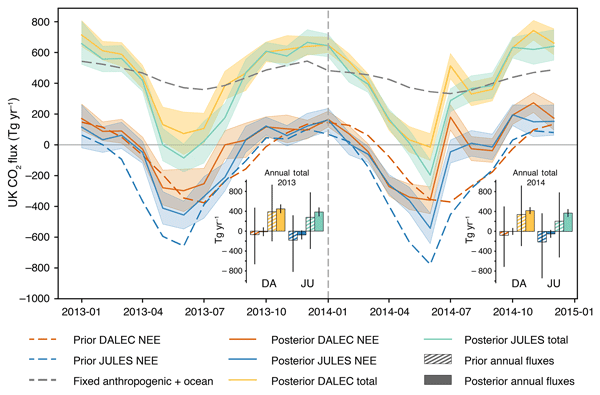 We show that a previously used measurement-based metric to identify changes in Arctic methane emissions does not reliably quantify these changes because it neglects the effect of atmospheric transport. A better metric will combine data and models. We present 14CO2 observations at a background site in Ireland and a tall-tower site in the UK. 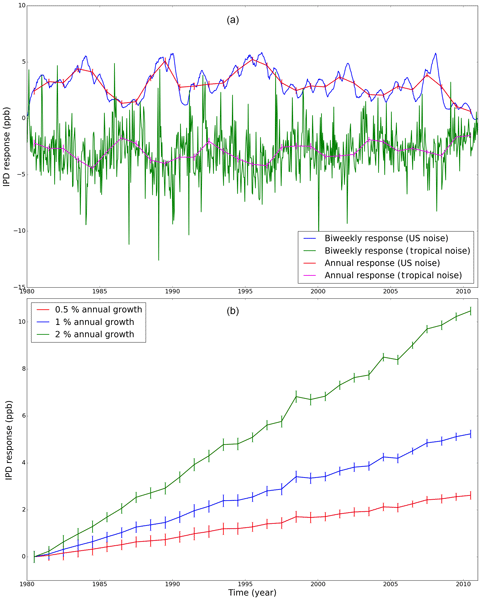 These data have been used to calculate the contribution of fossil fuel sources to atmospheric CO2 mole fractions from the UK and Ireland. 14CO2 emissions from nuclear industry sites in the UK causes a higher uncertainty in the results compared to observations in other locations. The observed ffCO2 at the site was not significantly different from simulated values based on the bottom-up inventory. 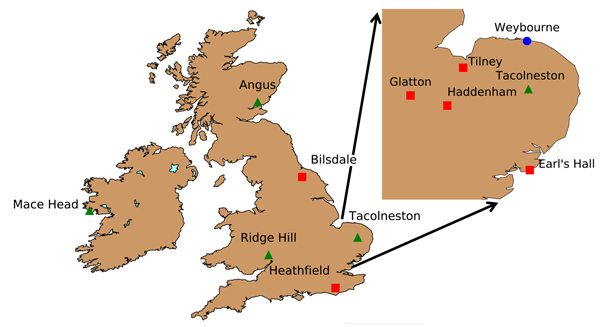 Under the UK GAUGE project, two new greenhouse gas observation sites were established in the 2013/2014 winter at two telecommunications towers. A combination of spectroscopic and chromatographic instrumentation was used to measure CO2, CH4, CO, N2O and SF6. The addition of the two new stations to the existing UK network of four stations was found to reduce the uncertainty of CH4 UK emission estimates by between 10–20 %. The impact of the sample drying strategies were also examined. High methane mixing ratios occurred at our long-term measurement site. Isotopic measurements show the source is a landfill 7 km away; the emissions were estimated using three different approaches. The emission estimates made by near-source and middle-distance methods agree well for a period of intense observation. The estimate of the inverse modelling is similar to the labour-intensive middle-distance approach, which shows it can be used to identify point sources within an emission landscape.